"As a writer, I feel the need to speak out my mind; hence I have been voicing my concerns publicly, irrespective of the threats to my life…"
The recently issued public statement by over 200 writers reflects the public perception of the threat to democracy that looms before us. I feel greatly distressed seeing the suppression of free voices in our country. Not long ago, the Tamil writer Perumal Murugan felt compelled to announce the death of Perumal as a writer following the brutal assault over his novel Madhorubhagan. Comrade Govind Pansare met his death because, in his book, he questioned the title Go-Brahman-Pratipalak bestowed upon Shivaji by the Brahmins. Earlier, the rationalist Narendra Dabholkar’s daylight murder shook the entire country. Profesor Kalburgi, with whom I had the privilege of working on the Vachana project, was killed by Hindutva terrorists because of his promulgation of Basava’s ideology of social equality. Yet another killing — of the firebrand journalist Gauri Lankesh — also sent shock waves among the people. I recall how Professor U.R. Ananthamurthy was also harassed for vociferously speaking out against right-wing extremism. We all know how Girish Karnad is being threatened by such faceless radicals. Many more writers and journalists face a similar predicament. In a recent episode in Maharashtra, Nayantara Sehgal was invited to inaugurate a literary event, the Akhil Bharatiya Marathi Sahitya Sammelan. Even after this was announced in the media, she was unceremoniously asked not to attend. People know very well at whose instance this offensive step was taken. As a writer, I feel the need to speak out my mind; hence I have been voicing my concerns publicly, irrespective of the threats to my life. We are constantly told how our present Prime Minister has become an ‘international leader’ and how India has entered the global superpower bracket. I feel honoured to know that. But I would like to see these statements substantiated. When we ask for such claims to be justified, we are branded as anti-nationals. We all know that the demonetisation move was an awful failure. But people are afraid to talk openly against it. We have seen how the minorities are being harassed and lynched on the suspicion of cow slaughtering. But have we heard any of these Gomata-worshippers getting annoyed at the news of hundreds of cows dying in the cow shelters of UP because of negligence? Beef eating is banned by ‘popular demand’. This restrictive notion too is created selectively. I was in BJP-ruled Arunachal Pradesh recently, where the people freely eat beef and have unrestricted supply of the meat. The BJP has turned the beef-eating issue into a political and communal issue in places where it suits them. Has anybody asked about these double standards? The heads of our educational and art institutions have been kicked out callously and replaced by yes-men, to run the organizations by proxy. Autonomy is a forgotten word. Does anyone question? Can anyone ask how many terrorists were killed in the much-hyped surgical strike on the Balakot camp? Can we ask why the then Defence Minister Parrikar was side-lined when the Rafale deal was struck? I did exercise my freedom of voicing my concern over the destructive Sanatan forces present in my peaceful Goa. But the government paid no heed. There was a time when votes were bought. Now they are buying elected representatives. Do we want this situation to continue? The answer lies with you and me. Let's defeat the fascist regime. Damodar Mauzo is a Konkani short story writer, novelist, critic and script writer based in Goa. 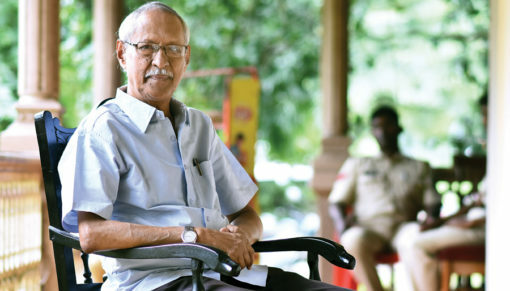 He was awarded the Sahitya Akademi Award in 1983 for the novel Karmelin and the Vimala V. Pai Vishwa Konkani Sahitya Puraskar in 2011 for his novel Tsunami Simon.